Much as I hate to say this – we are only just over 2 months away from celebrating Christmas once again! Although as believers, we actually celebrate Christ’s life EVERY day, Christmas is a time when the “world” is more aware of the story of Jesus’ birth. This makes it a wonderful opportunity to reach out and share the TRUTH and the LOVE of God – especially in the present time of so much uncertainty and hopelessness in so many parts of the world. We want to especially think of our African partners as they plan special events as well as celebrate with their own families. For many years we have sent packages of small gifts as personal expressions of our love and support, but sadly the cost of doing so has risen so high – to say nothing of the chance of packages getting lost en route! So again this year we want to suggest a “better” way of showing them our love and appreciation – and it consists of two simple parts. We are sharing the first part this month and saving the second part for next month. Part One is to actually send a special monetary gift through IMOF Inc. (100% of which will be sent to our African partners – not many ministries can say that!). We will be collecting these funds during the next month or so, before sending them on to our three African partners in plenty of time for them to prepare for their special Christmas outreaches in December, and be able to buy special Christmas gifts for their own families – and in the case of the Joseph Project Orphanage, for the staff and children there also. We have chosen to show more personal photos of them this month as a reminder of their families and how they live. Please make checks out to IMOF Inc. and attach a separate note stating if your gift is for a particular family or for the JP orphanage. Don’t forget, in Africa an average MONTHLY income ranges from $30-70, so ANY gift, however small, will be a great blessing! (2 Corinthians 8:12). Thank you, Gerald and Shirley. Mike in Kenya – He continues busy with children’s ministry in his local church and also in several local schools. Sadly, his bicycle was stolen recently and so now he is once again afoot, unless he can hitch a ride! (Not easy, carrying bags of children’s ministry materials or boxes of bibles!). His wife, Irene, has been raising baby chicks and now has quite a flock that will soon produce eggs or be sold (see photo). Due to the danger of wild dogs roaming at night, chickens are brought INSIDE the house to roost – a fact which no doubt inspired him to build a chicken coop upon his return from the UK last month! The photos below show Irene cooking, and Trevor with the twins, all dressed up in their dad’s shirts! Pastor Honoré in Central African Republic – Honoré and Clarisse both work full time in their ministry (called CEERCA) and spend a lot of time teaching leadership seminars in churches of all denominations in and around Bangui. As you can see from the 1st photo – there are no fans or a/c there! 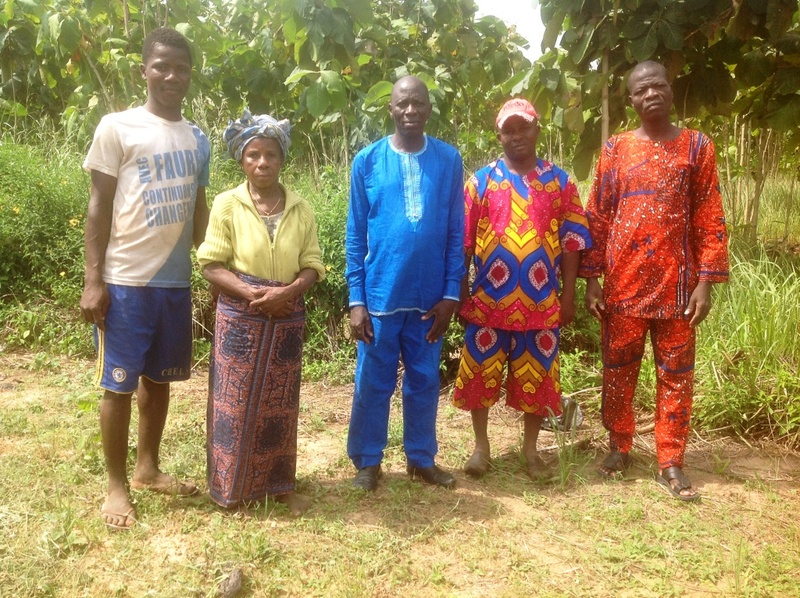 They are still held up with the building of their church and ministry center, due to lack of funds, but as you can see, their congregation continues to meet faithfully under the trees and tarps. With their 3 children, they have just moved into another rented house, a bit closer to the ministry site. 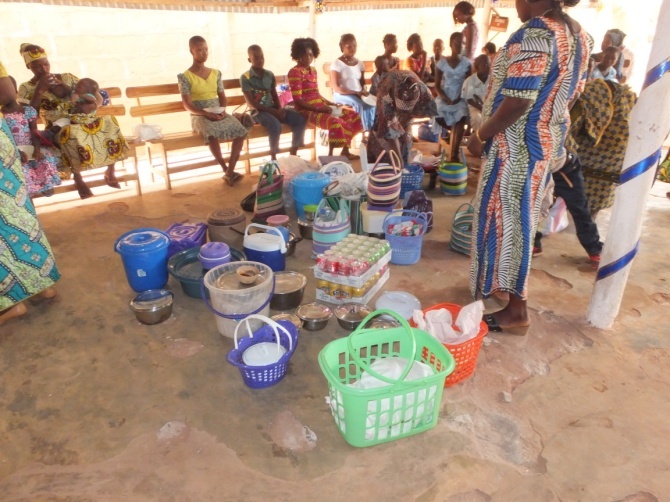 Pastor Sika in Togo – As you can read in his detailed report mentioned last month (and posted as a blog on our website) Pastor Sika continues to be very busy in many areas of ministry, including pastoring Bethany Baptist church in Lomé and overseeing the orphanage. 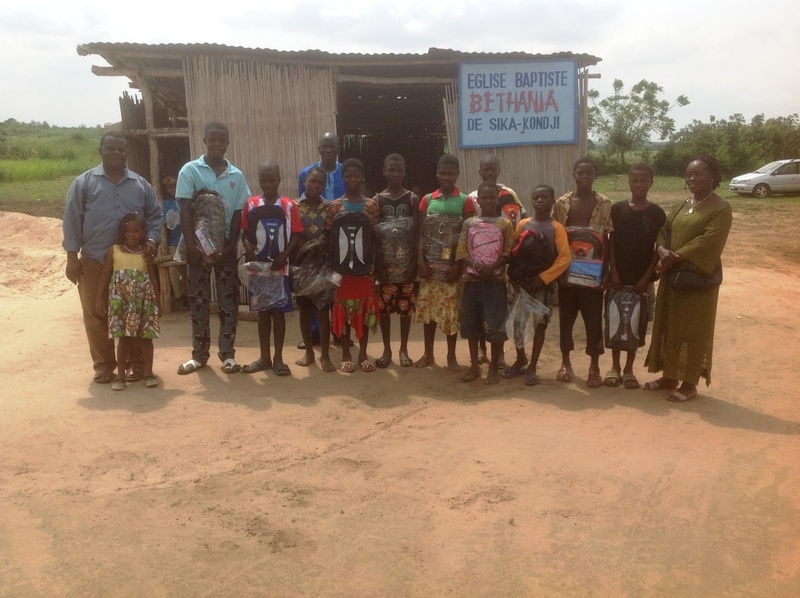 The whole month of December he is busy with special Christmas events (such as seen in the 1st photo, taken at his church in Lomé), visits to several prisons and schools, and usually some evangelistic outreaches. 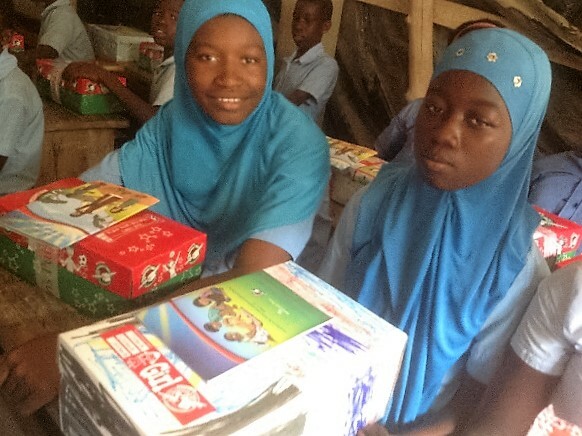 Of course he is also a major part of Operation Christmas Child in Togo, which actually kicks into gear soon after the New Year there (2nd photo shows Muslim girls receiving shoeboxes). This Christmas will be the first for all the children at the Joseph Project Orphanage, as the original group has all moved on. Since most of the children are from pagan/animist backgrounds, they are still growing in their understanding of Jesus and the Bible and so will possibly be hearing the Christmas Story for the first time. We certainly want this Christmas to be especially memorable for them. They all attend the little Bethany Baptist church in the JP compound (see 3rd photo) – which is also attended by several other villagers and children. We are also praying for some larger special donations at this time to enable the hire of laborers so that the construction of the new cement block building can be finished at last. The final photo shows the present staff at the orphanage, and we certainly want to remember them also in our prayers and giving! ← Why we are “sheep” and not “cows”!